Humblemud is a small player house in Dhalmora. 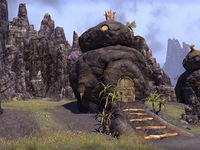 It is a simple Argonian mud house consisting of one room but has a considerable private courtyard, the least expensive house to have such a feature. To purchase it with Gold, you need to complete the Hero of Bleakrock achievement and A Friend In Need. This house replaced Nebaxireet's House in Update 12.